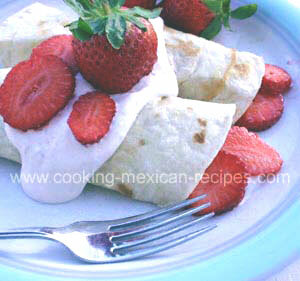 Strawberry crepe recipe – Mexican style or with a basic crepe recipe. This strawberry crepe recipe is a quick way to get a healthy breakfast on the table in the morning. Kids and adults will love the yogurt/cream cheese filling topped with fresh strawberry’s. The tortilla’s, cooked in a little butter, make up the delicious and easy crepe. Your family will be requesting this Mexican breakfast recipe more than once I’m sure. In a medium size bowl, add the yogurt and cream cheese. Mix with an electric mixer until smooth. Then add the lemon juice and mix well. In another bowl add as much sugar to the strawberry’s as to your liking, maybe 1/2 to 1 tsp. Add a little butter to a frying pan and heat to medium. Place a tortilla on top of the butter and work it around to cover the tortilla with butter as it melts. Place another slice of butter on top of tortilla. Turn the tortilla over when it browns. The butter will cook into the tortilla. Don’t let the tortilla get too crispy. You will be rolling them with the filling inside. When the first tortilla is done, remove it to a plate to cool. Cook the next tortilla the same way adding butter as needed. When the tortilla’s are done, add a couple of spoonfuls of the yogurt mixture to each tortilla down their centers. Lay slices of strawberry’s on top of the yogurt mixture and sprinkle with a little cinnamon. Roll each tortilla up with the seams facing down. Add the rest of the yogurt mixture on top of the crepes and add the remaining slices of strawberries. Top with an additional sprinkle of cinnamon. Serve your family this strawberry crepe recipe for breakfast and they will think you are letting them have dessert! Don’t tell them it really is a healthy breakfast recipe. Buy some whole flaxseeds at your local health food store. In a coffee grinder or blender, add 1 tbsp of the flaxseeds and grind to a powder. Sprinkle 1 tsp on top of each crepe. You will be providing your family with healthy omega 3 fats or essential fatty acids. And it has a delicious nutty taste too. Need to feed 4 or 6 mouths? You can double or even triple this recipe. You can also change the yogurt flavor to match your fruit of choice. During the summer months when we have such a variety of fresh fruits, you can make a number of different dishes with this one recipe. Try serving fresh blueberry’s and sliced bananas with blueberry yogurt. Or how about fresh peaches with peach yogurt? The combinations are practically endless. Strawberry and kiwi crepes sound great too don’t you think? So think of this strawberry crepe recipe as only the beginning and a great way to get your family to start their day with fresh fruit and yogurt.